When I finally researched the Mars Colony, I selected it in the Analysis Tab, but It showed me radiation levels and heat etc from Venus and Mercury! The only thing that partially worked was when I clicked on Io (which was not researched yet) it showed Low Mars Orbit ._. It kinda worked, but I had to guess a lot when I put a colony to Deimos orbit. Hey, thanks for posting! We really appreciate the feedback. ...which is that the Radiation label in the Analysis tab gets cut off if the orbit name is too long. 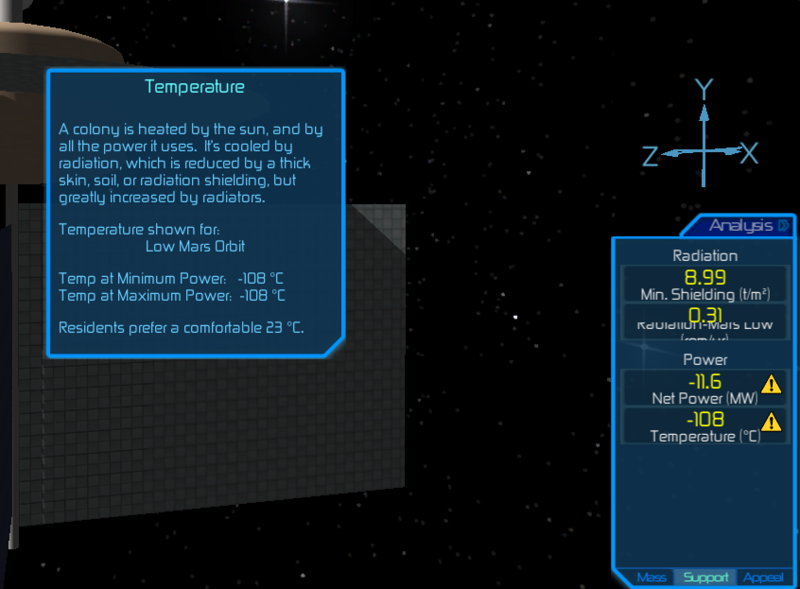 But you can still see that it's showing radiation for Mars Low orbit, as is the temperature (warning panel shown above). Can you give me any more clues how to pin down the problem you're seeing? (07-31-2017, 10:59 AM)JoeStrout Wrote: Hey, thanks for posting! We really appreciate the feedback. These are my techs when the Bug occurred. Anyway, we'll get to the bottom of it, and get it fixed for the next release!